Last week I read in the Guardian about the discovery of what could be indications of a very early Christian church and burial site beneath the current York Minster. If Williams is right, this could be the place Hild was baptised by Paulinus in 627 CE. It also means the bones found in situ might belong to some of her relatives. To me, this is all so thrilling I can hardly stand it. I’d give a great deal to be there right now, to look at the pit, to touch those bones, to know, deep down, that Hild really did exist. I wish, too, that someone would provide a map so I could see exactly where they found those post holes. 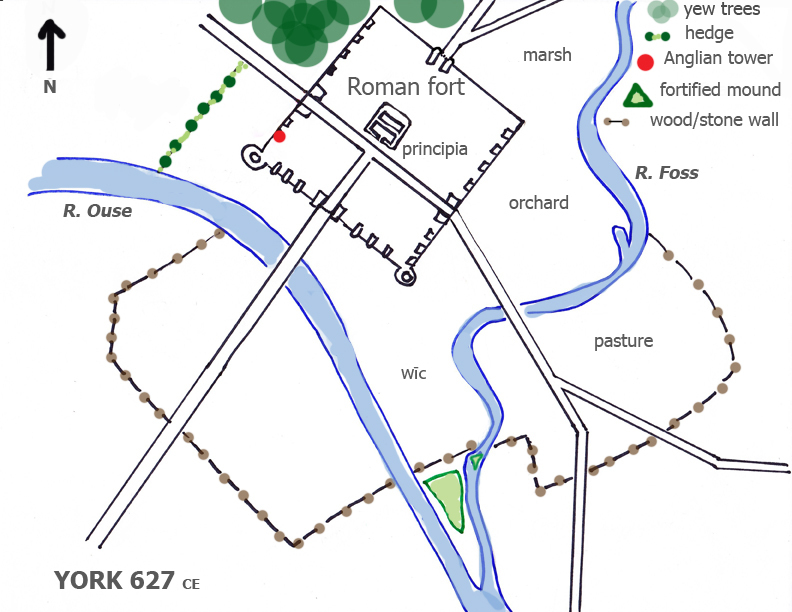 In Roman times York was known as Eboracum, the major city of Northern Britain, legionary headquarters, with an inner, fortified military zone surrounded by a larger, semi-fortified colonia (civilian settlement). It sat in the fork of two rivers, the Ouse and the Foss, and at the nexus of significant roads north and south (which became known as Dere Street and Ermine Street, which in turn became the A59/A1 and A1079/A15/A10, respectively). It was important. It was large (the inner fort alone covered about 50 acres/21.5 ha). The military headquarter building (principia) was 70 meters wide. 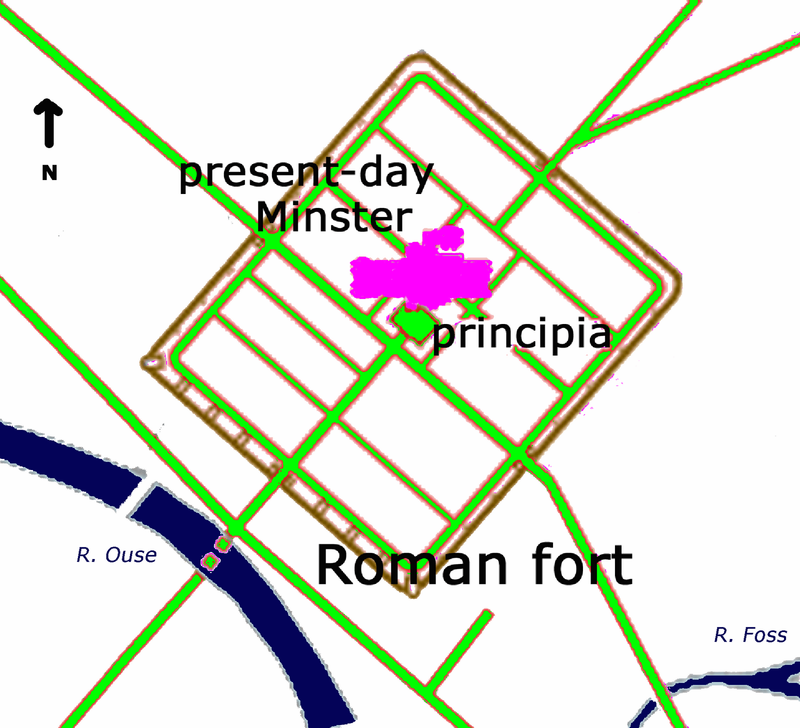 The Romans built and rebuilt the walls and roads at various times. They built well. By Hild’s time, the walls of the inner fort were still standing, and the roads were in good repair. Edwin rebuilt one tower, now known as the Anglian Tower (marked in red) with stone that was a poor match for the original, made of oolitic limestone as opposed to the beautifully cut magnesian limestone of the original. The Roman colonia was also protected by walls, too, though only the southern half; the north, probably, was protected by marshlands created by the R. Foss spilling over on a regular basis. The Romans would have controlled this to the degree that suited them, but when they left, much of York would have been swamped. When Edwin reclaimed York the climate was drying a bit so the ground was less swampy. He also redug and partially redrained. As a result he had to put in additional protection, notably in the form of a great thorn hedge to the west of the inner fort. He also strengthened the remains of the stone civilian walls with wood, and built wooden watch towers in the notch of the two rivers. One thing I’m not sure about is where Edwin might have put his brand new wīc or trading area. It makes sense to me to put it between the rivers and under the eye of armed men on the walls in the wooden towers, so that’s what I’ve done. But I dithered: that bit might still have been too marshy; maybe it should go just east of the thorn hedge. In the end, though, I couldn’t resist putting it in a more open, sunny place. Inside the fort, most of the buildings would already have been scavenged for building stone. I’m imagining the principia, the great headquarters building, still mostly standing. It would have had a great courtyard with a well, and a huge cross hall for state events. This hall I imagined as Edwin’s feast hall. Perhaps some of the south-east rooms could have been made habitable again and turned into women’s apartments. The rest was mostly cleared for gardens, used as storerooms, or turned into kitchens and bakehouses. One large area in the south east corner of the fort was reserved for exercise/military training. I think of it as the parade ground, the place where Edwin might have assembled his gesiths and baggage trains before marching out. So where did Edwin build his church? That was easy: in the yard of the principia. There was a well, which Paulinus could easily have turned into a font. It would have been sheltered from the wind by the walls of the headquarters building, and it was in the exact centre of Edwin’s most powerful royal vill. We know that the succeeding church, built by Oswald, was made of stone, so the odds are good that if the finds mentioned in the Guardian last week are, in fact, a church, it was the original. I like the odds. And given the traditions of the time–to build on what went before, that is, on the same alignment and overlapping the same footprint of the original or its successor–I’m satisfied that my version of events was at least possible. Hild gets more real every day. I subscribe to British Archaeology and this story will, no doubt, be in one of their updates or, perhaps, cause a full-scale article. I'll keep an eye open for you. Exciting news, even if we are not sure of anything yet! I (and many others) had always assumed that the A-S wooden church was somewhere under the current Minster, so fingers crossed. But I thought there had been some relatively recent finds of an early A-S settlement to the SE, on a bit of a hill in the location you have marked as pasture on your map? Sally, do you have a link for news of those finds to the south-east? 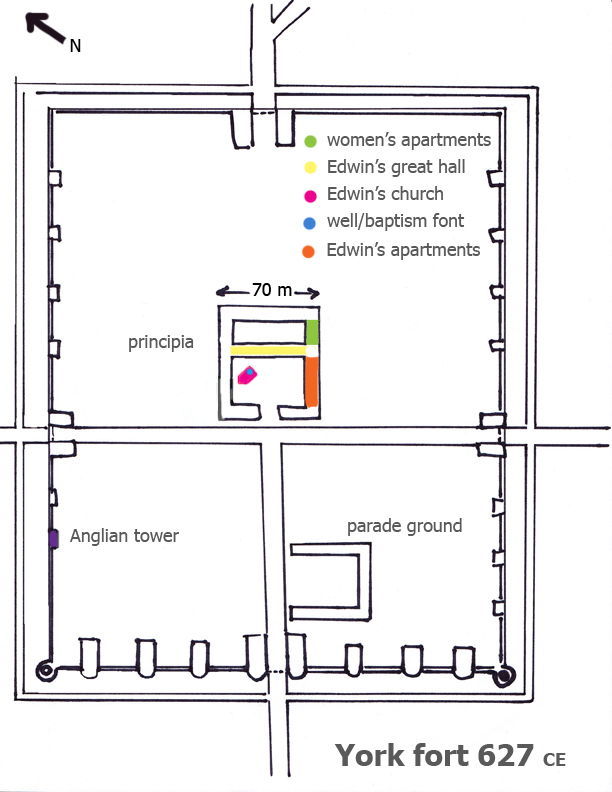 Cecily A Spall and Nicola J Toop, 'Before Eoforwic: New Light on York in the 6th-7th Centuries', Medieval Archaeology, 52, 2008. I am not sure whether this is available on line unless you go through an institution that subscribes to Medieval Archaeology. Sadly I don't have access to that, though, wow, it sounds perfect for me! Thanks for the ref. I haven't yet seen that Spall & Toop paper, but I did recently read a Richard Hall chapter called “The Making of Domesday York”, and if I follow my notes correctly, he reckoned that on the very limited evidence available in 1988 the best guess for the Saxon wic's position was across the Foss, roughly opposite where you've marked an orchard, where a bit of ceramics and a few coins had come up. I'm guessing this is no longer the current state of knowledge but it might still answer the question for your purposes. tenthmedieval, interesting. Hmmn. I'd just assumed that was a seriously marshy area, not good for much. I shall investigate. Thank you. Sandra, yes, my novel will be available in all formats: print (hardcover, followed by trade paperback), ebook (for all major ereaders, including Kindle and Nook), and hopefully audio (though I'm not entirely sure of the latter right now). I don't know what the publication date will be. I'm hoping late next year, but I'm not sure. I'll certainly tell the world when I know. Welcome to the blog. Isn't the redesigned HNS website great?